Here is what I learned from making my own book video. I hadn’t really given it much thought until I started writing this post. For four years, I tried making my own video and it just wasn’t working. Either it looked corny or ammateur. So, I tabled it. Every year I’d put myself through this ordeal, over and over. I saw indie author friends proudly sharing their book videos and I was tempted… but still too nervous to try. I felt like the little girl too scared to jump in the swimming pool even though she could swim well. Duh. I even stuck a toe in and looked into having someone create the video for me but the price was too much for my wallet. So, to the back burner the video project would go again. I had several struggles I wasn’t grappling with too well. First, I knew I needed to make a video, but to be frank I didn’t think I had enough knowledge of marketing to know what would work and what wouldn’t. Another challenge is Bumbling Bea was written for middle grade students, but many adults read it as well. Do I try to market this to both groups? So what did I learn about making my own book video? Don’t do it. Let someone else. Oh, that sounds so curt and cynical and honestly I’m not. I thought I could create one myself. Well, you know how that goes, right? Should I include any of the artwork from the book itself? Should I include quotes from reviews? Should I mention awards Bumbling Bea has won? Do I put it on Youtube? Yikes. You can see how all of these questions rumbling around in my brain in the early hours of the morning (usually around 4:00 a.m.) were bothering me. Ha, not bothering me enough to do anything about it though, right? Beatrice thinks she has no talent, but that doesn’t stop her from entering the annual middle school play. Easy. Except a new girl from Japan comes along and ruins everything! So begins Beatrice’s humorous and diabolical journey to scare away the visitor. Except Michiko has goals of her own with no plans to leave soon. What’s a girl to do? Plenty. Do things occur in your life which point you in the right direction, even though you weren’t even looking for them? In May out of the blue, a guy contacted me about creating the video. I won’t give you his name, because after he made it he wouldn’t communicate with me any more. I guess he’s a one shot deal with no changes. I wish he’d told me that. On the other hand, I didn’t sign a contract or anything. It was a great deal, really. What did I learn from making my own book video? Have you had a similar experience? Do certain things of your interest or business absolutely pretrify you like they do me? Let’s talk. Stage properties are a lesson in wondrous creativity. When I was studying theatre in college, the first back stage crew I signed up for was stage properties. Boy, I had a lot of learning to do! The show was “Look Homeward Angel” which is a period piece set in the early 1900’s. My job was to serve as an assistant of sorts to the cast. I would hand them props or take them from them if they were in a hurry. I prepared the set each night before the production, put the props away after the performance and kept them in good repair. I hadn’t really given props much thought although I had been in charge of them in high school as well for “The Miracle Worker”. That was high school, you know? I lived in a small town in Kansas and we didn’t have the money or energy to do more than the basics. But college was a whole different experience. I always advise my students that if they want to go into theatre as a profession, stick to technical theatre because you’ll be hired more often than an actor. Good properties people are hard to find. When I graduated from college, I spent a summer as a stage properties mistress at the Okoboji Summer Theatre. It was an incredibly difficult experience–ten shows in nine weeks. I can handle a lot, but this job nearly broke me. In case you didn’t understand that, I said 10 SHOWS (different) in 9 WEEKS!!! 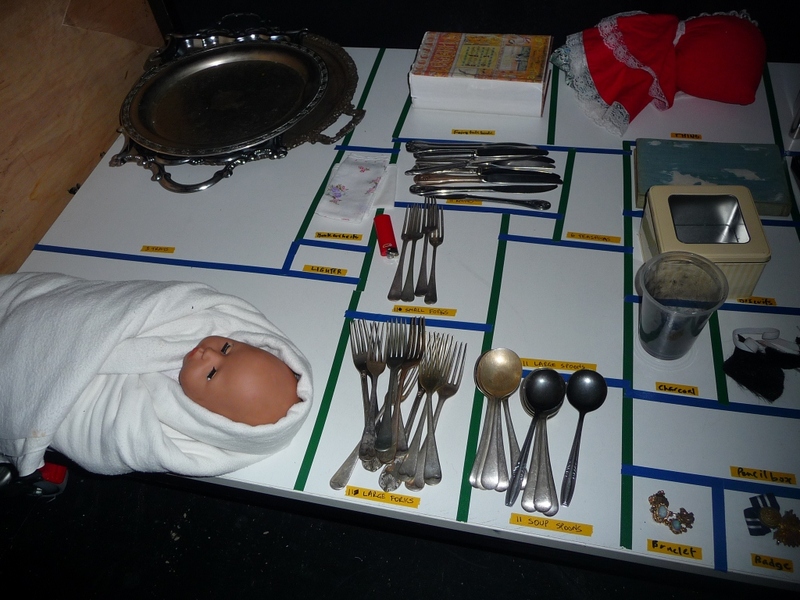 Most productions have many props they need. Musicals and comedies have the largest number. Plus, all the things which are made from scratch such as swords, daggers, child’s coffin, and a grave marker to name a few. See? These are pretty fun and students studying theater need to know about the subject. Stage properties are a lesson in wondrous creativity! Those of us in drama education have a tendency to gloss over stage properties when we teach about them. I inform students if they like to make crafts, enjoy theatre and art they are going to love stage properties. This one-day lesson about stage properties (with fairy tales as the focus) is suitable for upper elementary and middle school students. It is engaging, fun and unique. Students learn about stage properties, view video examples, take notes, team up with a classmate and use their imaginations! So look into my Stage Properties product, will you? I think it will help you and your students. What are some stage properties you have created? I’d love to learn about them. There you’ll find units on storytelling, tableau, radio theater costume design, Shakespeare and new products each week! Who lurks in the ocean deep? Sedna is the Inuit goddess of the sea. According to most versions of the legend Sedna was once a beautiful mortal woman who became the ruler of Adlivun (the Inuit underworld at the bottom of the sea) after her father threw her out of his kayak into the ocean. Sedna’s fingers, which her father had to cut off to keep her from clinging to the side of the boat, are often said to have turned into the first sea mammals. The other details of Sedna’s story are told differently in different Inuit/Eskimo communities– sometimes she provoked her father’s rage by attacking him or violating cultural taboos, while other times her father was selfishly trying to save his own life by sacrificing Sedna. Fascinating story, huh? I liked it so much I adapted it into a class play for upper elementary and middle grade students. I am now selling my lesson plans and units on Teacherspayteachers.com. You can thank my dear husband for continuing to encourage me to put together all of the lessons and units I have created over thirty-eight years. So far, as of this writing I have available 50 products to purchase for grades second through twelfth. This last one, Sedna, an Inuit Tale is probably one of the most involved. I adapted multicultural stories when I taught in a middle school for twelve years. There was simply very little material for class plays and that is what I needed. Desperation is the mother of invention, you know? A drama class, reading group, Social Studies will find this very useful. My husband, a retired instrumental music teacher with lots of composing experience, created a song reminiscent of the Inuit culture’s music. This is a terrific co-teaching experience, too! A drama teacher and vocal music teacher working in tandem on the piece is such a great opportunity for learning. You know? Now, my version of Sedna isn’t quite so gruesome, but creation myths can be very dramatic and Sedna follows suit with other mythological fables. Do you need a story dramatized but don’t have the time to do it yourself? No problem. I LOVE to adapt multicultural folk tales into plays. Contact me at dhcbaldwin@gmail.com and we’ll talk! I’d love to help you.